weave and 4 Guests are viewing this topic. LOL yes indeed Nick, as I'm painfully aware! Not to worry though, it shall appear (as if by magic) as a later phase. 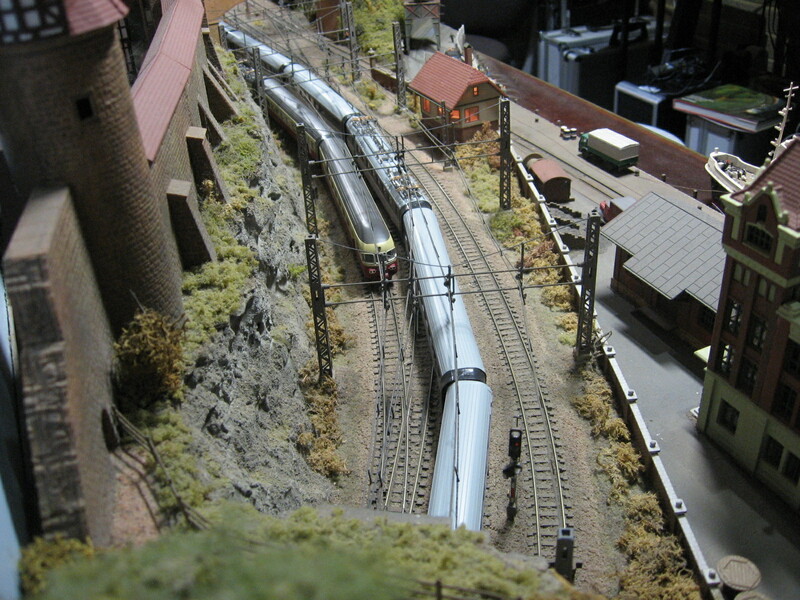 Aaah Catenary, the great challenge for all continental layouts cant wait to see what you do with the overhead. I was lucky enough to find a box of old nice catenary and wire at a show in Vancouver for CDN$50 Its in good shape, but I'm not sure if I'll use the wires or just the masts. What do you plan on doing? .. I'm not sure if I'll use the wires or just the masts. I've seen a few layouts which just have the masts and no wires, the argument being that the wires are pretty much invisible from normal viewing distances. Personally I like the effect of the pantographs riding the wires, so my layout has a full installation using the old Vollmer and Minitrix stuff in the scenic sections. I don't bother to energise it though, and have no "knitting" in the storage yard. It's definitely overscale but robust enough to have survived 70+ exhibitions over 20+ years. Hmm... what's this Spanish electric unit doing in Germany?? I have to admit that the reason I will only have representative catenary masts (not as many as would be seen, plus no wires) one day is cost. Even with the cheaper masts a whole set-up will somewhat eat the budget, which I’d rather use for rolling stock and scenics. That’s even though I would agree that locos running around with pantographs raised look a bit daft without having something for them to engage with, or just appear to engage with. As your layout proves Nick, full catenary in place does look so much better. And I look forward to seeing catenary appearing on your layout Matt. I'm going to use HO rail to make masts, probably soldered. Most likely I'll have no wires. We'll see, like I say, that's going to be the final phase of the project. Likewise Daffy, I just can't be spedning a zillion pounds (or a gizillion euros) on pre-made catenary!!! Whether or not to add wires to the masts is a question that crops up regularly. Personally I think that the type of layout plays a big part in answering the question. 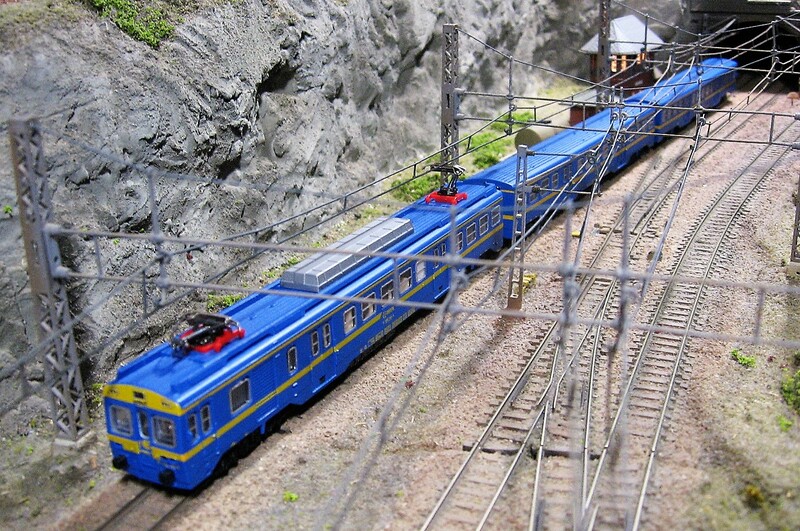 There is no doubt that a pantograph riding the wires looks good but to obtain that effect requires a fully wired overhead system that is substantial enough to withstand the forces exerted on it. In N Gauge, unless you have the skills to design and build your own, this invariably means overscale masts and wires and whilst you can get away with this on a large exhibition layout with predominantly straight tracks the catenary starts to look overpowering on a small home layout. 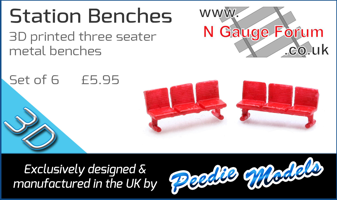 Even in N Gauge many of us still have unrealistically sharp curves on our layouts and the number of masts required to fully wire one of these curves only serves to emphasise their existence. 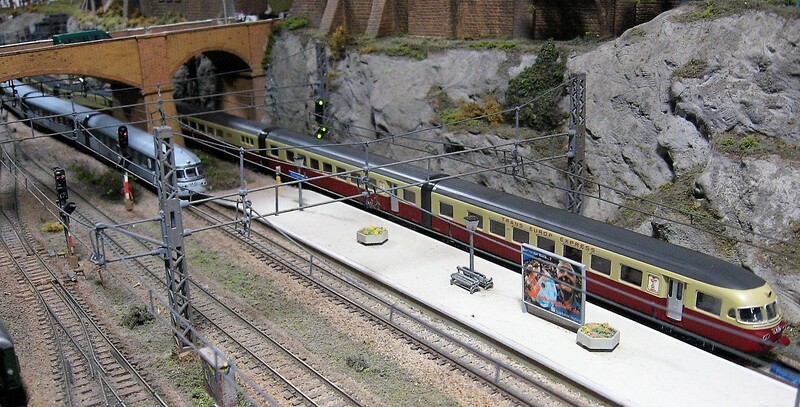 On my last Swiss layout, like Nick, I used fully wired Vollmer catenary and although it wasn’t really the correct style I didn’t think it looked too bad. That was probably because most of the visible track was straight with the curves hidden in tunnels. When I started on my current layout I had every intention of using the correct style Sommerfeldt catenary, once again fully wired and although I later abandoned the idea all my tunnels still contain the solid catenary that the visible wires were going to link to. I started to install the masts and wiring on one of my curves and was amazed at just how many were required to get a fully functioning system. I thought it looked awful and immediately decided to abandon the idea of a fully wired operating system and just use masts and gantries to create the impression of an electrified railway. The masts can now be virtually correct scale and because they do not need to carry wires you can cheat to some extent and space them further apart than they would normally be. As it happens more and more locos are now being sold with pantographs that either won’t track along overhead wires or are too flimsy to do so without being damaged so I don’t feel too bad about losing my wires. Thats a very good bit of advice John, thanks for sharing it. Thats whats great here is that we can get opinions from people who have actually tried what we're attempting! Yes that is definitely a phenomenon I've encountered too: newer models with finer and narrower panto heads. I have to be careful to try any new loco slowly round the layout to make sure the head doesn't fall off the wire or catch at pointwork. On a couple of locos I've actually replaced the panto heads with older style wider Sommerfeldt heads. I tried to stick to reasonable curves on the scenic section of my line. This curve which also incorporates a crossover and other pointwork is one place where there are more masts than I'd like, but I wanted to avoid any need to actually curve the wires (that's so unrealistic looking in my eyes). Hmm Swiss trains have definitely invaded Germany in these photos I've been posting I do love these old Hobbytrain units though. Whether or not to add wires to the masts is a question that crops up regularly. Personally I think that the type of layout plays a big part in answering the question. That's really interesting John to hear of your experiences with this. I have to admit I figured that sharp curves were going to a problem and had therefore already mentally ruled out having wires. Now I know they would definitely be a big problem. I think layouts look really good without the wires, as per John's. I have no problem with running locos with the pantographs down. That shot is Eurocity-grey-mouse-tastic! I remember travelling on a grey mouse from Zürich to Milan many moons ago. It had electrically operated blinds on each window, something I found very impressive! ............….Hmm Swiss trains have definitely invaded Germany in these photos I've been posting I do love these old Hobbytrain units though. Yes Nick, great models although the inter-car connectors on the earlier versions could be a bit temperamental. They were from the days when Hobbytrain locos really were made by Kato. I also thought the "Grey Mouse" was fantastic Matt. It was one of the first models that I bought when I started modelling the Swiss scene.